This event brings together people from different communities to raise awareness of the value of all languages, especially endangered languages, in a multilingual and multicultural context. 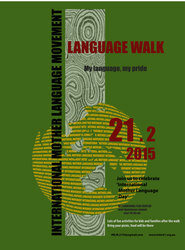 This is the second year that the Canberra-based International Mother Language Movement (IMLM) has organised this event. Over 300 people attended in 2014. The walk will cross Commonwealth Bridge and end near Regatta Point where there will be multicultural entertainment and free fun activities for children. The aim of International Mother Language Day is to promote linguistic and cultural diversity and multilingualism. Language is immutably linked with culture and cultural identity. Supporting heritage and mother languages not only helps preserve cultural pluralism but encourages Australians to develop the communication skills and cultural understandings which facilitate trust and mutual respect across all communities. 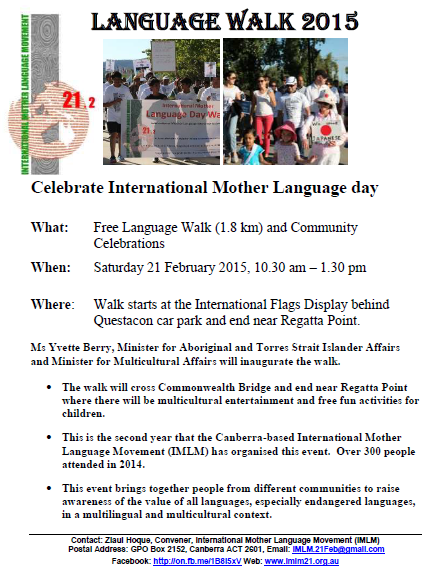 Meet at 10.30am near the International Flags Display behind Questacon car park to join the language walk over Commonwealth Bridge. Feel free to bring along posters and banners publicising various languages and/or to wear national dress. Free T-shirts for all participants! Name writing in various languages. Performers from different ethnic groups will perform in the event. There will be multicultural food for sale. Where: International flags display behind the Questacon car park, followed by festivities at Regatta Point. 4 million Australians speak a language other than English – but is that enough?